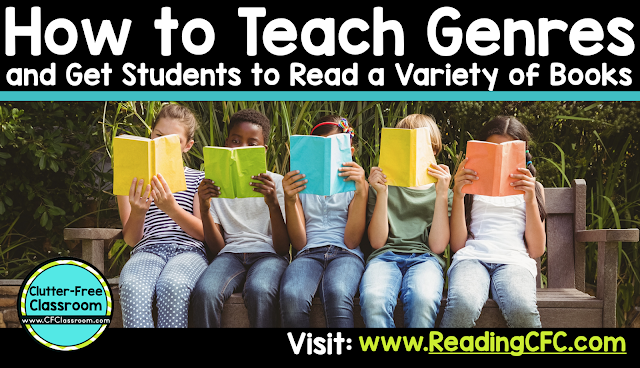 As a teacher you want your students to read and experience a wide variety of literary genres, but often it is hard to get them interested in straying from their usual book choices. 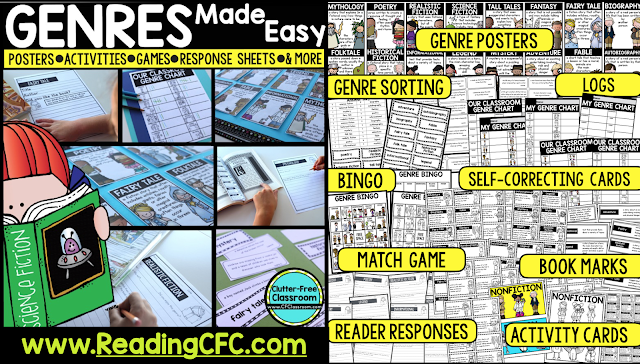 This blog post will explain the benefits of reading different genres and share ideas for lessons and activities to help teachers inspire and motivate their students to read a variety of genres. 1. Reluctant Readers = A student who struggles with reading a novel may fall in love with poetry, or biographies, mysteries (or even horror!) and be able to improve their attitude about reading by being exposed to many other varieties of literature. 2. Vocabulary = Each genre of literature carries with it an opportunity to learn a wider variety of vocabulary, which the student will need as they read more, and also as they progress in their academic career. 4. Confidence = As a student learns how to interpret and understand one literary genre, their confidence will build as they broaden their horizons to learn from other genres. 5. Reading Skills = The development of so many reading skills relies on teachers modeling those skills, such as fluency, by using many genres of literature. 6. Bring on the FUN! = So often we are focused on what the child must read, and how much time we must spend reading, that we forget that one of the best aspects of books and reading is that it should be fun and relaxing and pleasant to read! Finding a genre of literature that a student will love to read, by exploring many genres, is the key to making reading fun and to developing a love of reading that will last a lifetime! Filling your classroom bookshelves with a collection of titles and series from a broad spectrum of genres is important. However, that alone may not be enough. You need to also provide your students with lessons, activities, and resources to inspire and motivate them to explore all different types of genres. Start by teaching your young readers the difference between fiction and non-fiction. Avoid telling them that fiction is make believe and non-fiction is real. Instead define fiction as “a story with characters and events that have been made up in the author’s mind.” Explain that non-fiction books are informative. Use actual non-fiction books and explore the text features. From there you can start to focus on the characteristics that define each genre. One simple activity that makes a great center is to place a collection of books on a table and have the students sort them by genre. Only select a few different genres at a time until the students become more skilled at identifying them. Continue this practice with other centers that include sorting activities and matching games as ongoing review. Display Genre Posters on a Bulletin Board or in the Classroom Library. 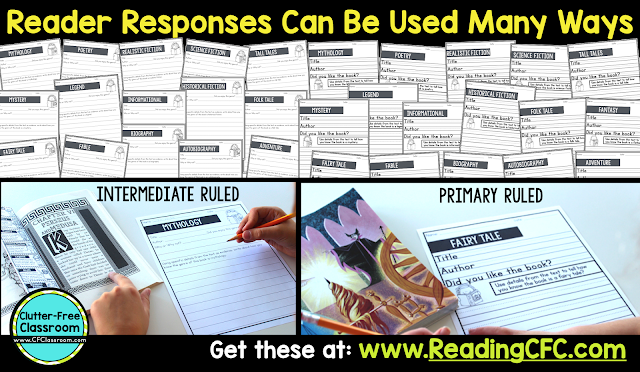 Offer additional support by displaying reference posters in the classroom and by giving each student a bookmark to remind them as well. Motivate the Students to Read Different Genres. 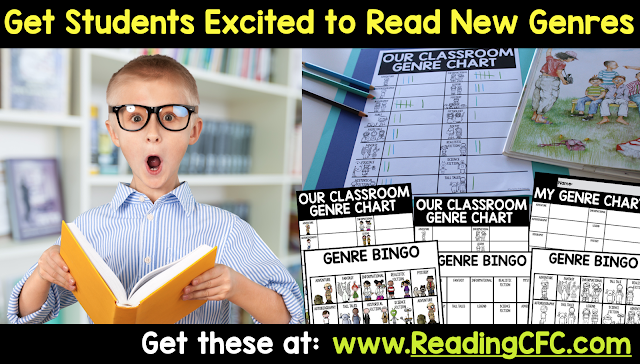 Encourage students to read from the different genres with incentive charts. Two of my favorites that I’ve found to be extremely effective are tally charts and Bingo boards. I display and use a whole class version for read aloud books we’ve enjoyed together and provide each student with their own copy as well. You can help students to reflect on their experiences with different genres by recording their thoughts on paper. When finished you can display these for other students to read as recommendations. For a great looking bulletin board you may want to consider hanging them with a photo of the child holding the book they wrote about. 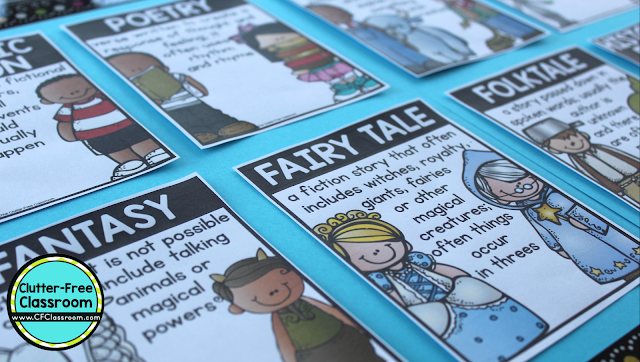 The written reflections can also be assembled into individual student books by collating several different genres. Another option would be to have each student write a reflection on a different book from the same genre to create a class book that the children can read to find new titles. Additionally the reflections make a great assessment tool of student understanding. 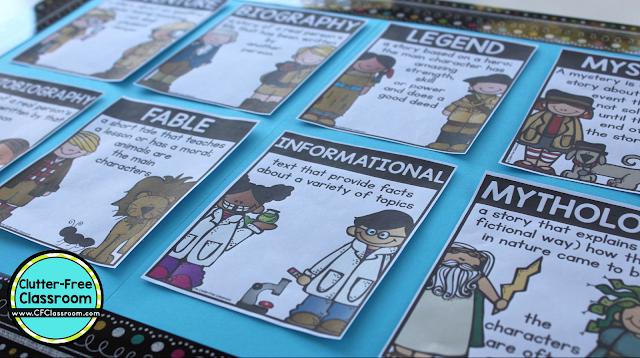 Classroom teachers are welcome to create their own versions of each of the items shown for personal use in their own classroom. However, if you would like to save time I have made all of them available in a quick and easy packet titled, Genre Made Easy so you can just print and go and have your students enjoying a variety of genres in no time.